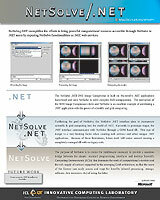 NetSolve is a client-server system that enables users to solve complex scientific problems remotely. The system allows users to access both hardware and software computational resources distributed across a network. NetSolve searches for computational resources on a network, chooses the best one available, and using retry for fault-tolerance solves a problem, and returns the answers to the user. A load-balancing policy is used by the NetSolve system to ensure good performance by enabling the system to use the computational resources available as efficiently as possible. Our framework is based on the premise that distributed computations involve resources, processes, data, and users, and that secure yet flexible mechanisms for cooperation and communication between these entities is the key to metacomputing infrastructures. Some goals of the NetSolve project are: ease-of-use for the user efficient use of the resources, and the ability to integrate any arbitrary software component as a resource into the NetSolve system. 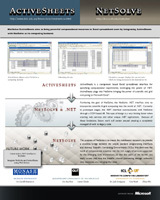 Interfaces in Fortran, C, Matlab, Mathematica, and Octave have been designed and implemented which enable users to access and use NetSolve more easily. An agent based design has been implemented to ensure efficient use of system resources. One of the key characteristics of any software system is versatility. In order to ensure the success of NetSolve, the system has been designed to incorporate any piece of software with relative ease. There are no restrictions on the type of software that can be integrated into the system.